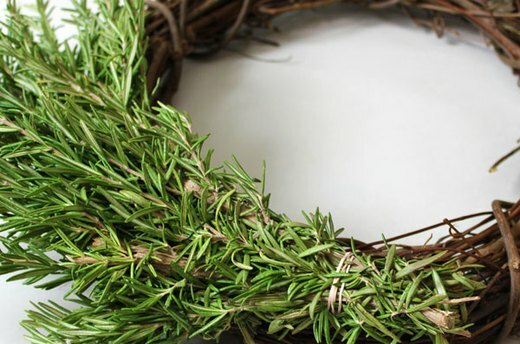 A wreath of fresh herbs is so much more than a festive holiday decoration. It is as functional as it is beautiful, providing a veritable garden of herbs that will add flavor to your recipes throughout the season. Whether you hang it on your front door, keep it handy in the kitchen, or give it as a gift, this herb wreath is sure to be a hit for the holidays. 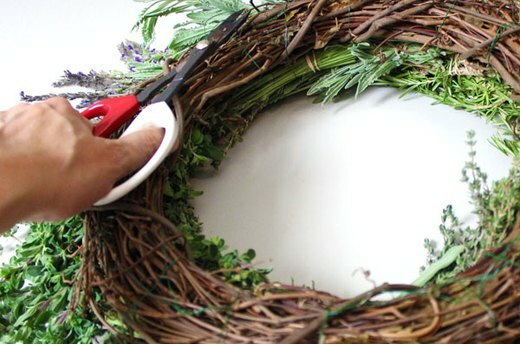 To make an herb wreath, you'll need a 14-inch grapevine wreath, fresh herbs, florist wire, rubber bands, and scissors. In the floral supply section of your local crafts store, you can find many types of empty wreaths that can serve as a foundation, including grapevine, raffia, foam or wire wreaths. Grapevine wreaths offer a natural look, and will still look good as you remove herbs for cooking. Choose herbs that will dry on the wreath, instead of ones that will shrivel and die. 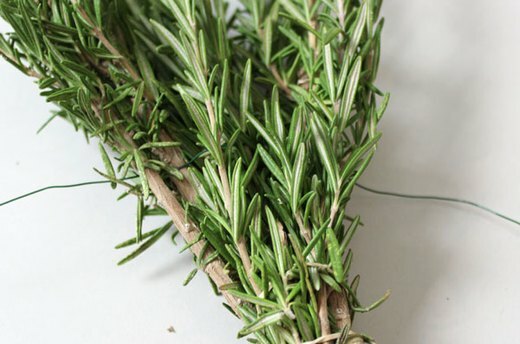 Rosemary, lavender, thyme and bay leaves will keep their shape beautifully, and their scent lingers long after the holidays are over. Avoid herbs like basil, parsley or mint, which wilt within a few hours out of the refrigerator. Sage dries nicely, but it does droop. Therefore, hang it upside down on the wreath so the drooping is not as evident. For this wreath, we are arranging the herbs in bunches rather than mixing them. 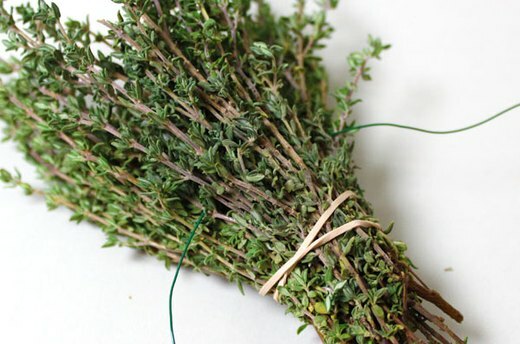 Divide the individual herbs into mini bunches, tying them together with a rubber band. 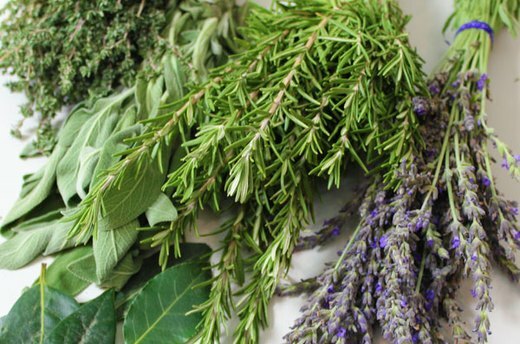 It is much easier to arrange the herbs when they are in smaller bunches versus one large bunch. Cut about 12 inches of florist wire and thread it through the herb branches. 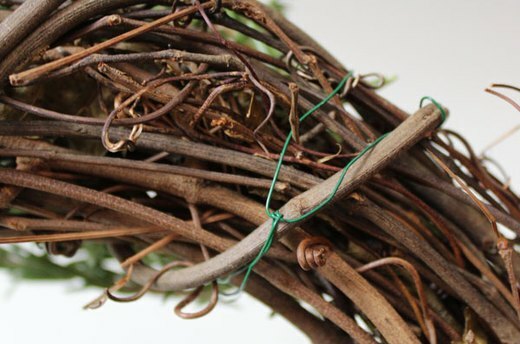 By placing the wire between branches, you will get a firmer grip when the herb is attached to the wreath foundation. If you do not have florist wire, thin multi-purpose wire or a long twist tie will also work. Position the herb bunch on the grapevine wreath foundation and wrap the wire around the back, twisting the wire ends where they meet to secure them. Sometimes it is easier to place the wreath upside down while twisting the ends. Tug on the herb bunch to make sure it is secure. When you tie the herb to the wreath, the wire practically disappears, but the rubber band at the bottom is clearly visible. To hide the rubber band, overlap herb bunches. As you add bunches, each one hides the rubber band on the one before it. Notice that with the rosemary, all the bunches are facing the same direction. 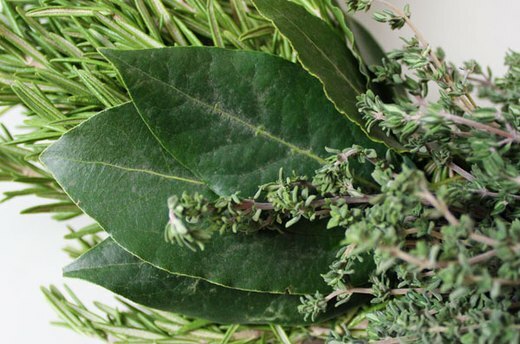 Keep all your herbs in the same direction for a neat appearance. 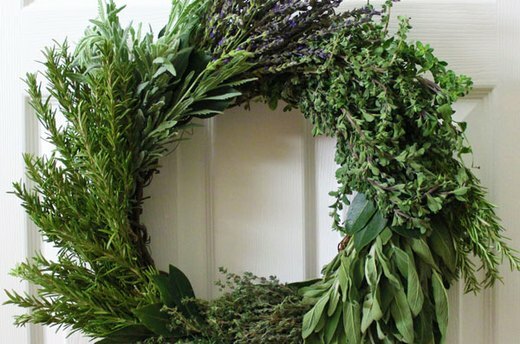 When arranging herbs on the wreath, try to alternate textures to add visual interest. 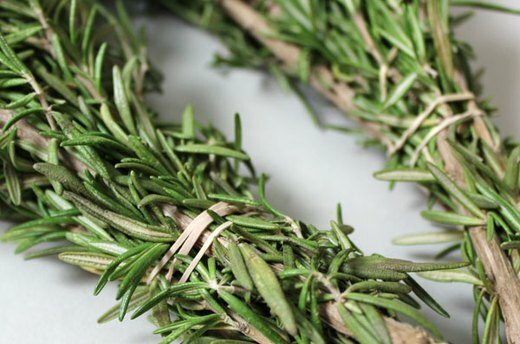 For example, after the long, prickly branches of rosemary, the next herb selected was the shorter, leafy thyme. 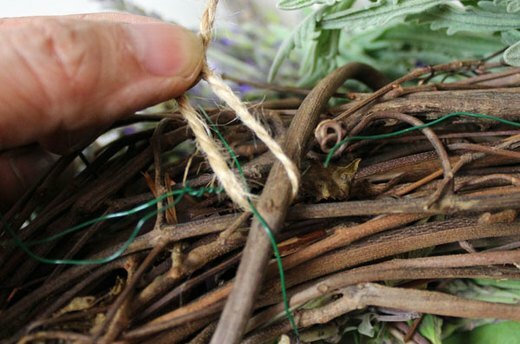 Again, these herbs are divided up into small bunches, tied with a rubber band. Then wire is thread through them and they are then tied to the grapevine wreath foundation. Fresh bay leaves are great for herb wreaths, but because they are loose, they need to be prepared before they can be be attached to the wreath. Cut about 12 inches of wire and bend it in half to create a "U." 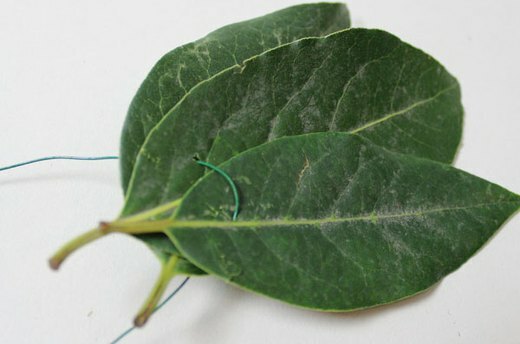 Arrange three bay leaves in a fan shape, and insert the wire into the leaves to hold them together. Wrap the wire holding the bay leaves around the wreath and twist the ends together in the back. Bay leaves are interspersed throughout the wreath rather than keeping them in one section. As with leaves in a floral arrangement, the bay leaves act as an accent for the surrounding herbs. After arranging all the herbs on the front of the wreath, the back of the wreath is full of excess wires. Not only are they unsightly, but they could potentially scratch your door. Cut any excess wires, and tuck the ends underneath the grapevine branches so they do not stick out. Decide what is the top of the wreath, and tie a string loop to one of the branches on the back near the top. Using the loop on the back, hang the herb wreath on a door. If your door does not have the appropriate hardware for hanging, an easy solution is removable adhesive hooks like 3M Command Strips. 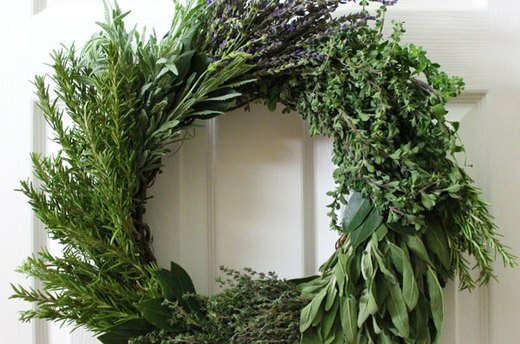 Your herb wreath will bring beauty and fragrance to your home all through the holidays, and beyond.